27th February 2018, New Delhi : The Packaged Commodity Rules 2017 amendment which came into effect from 1st January 2018 laid emphasis on one product, one price. The PCR Amendment prohibits dual-MRPs on products, by the virtue of which no person shall declare different MRPs on identical pre-packaged commodities unless otherwise permitted. This move was intended to benefit consumers at large, considering that consumers have been facing the issue of different MRPs being charged for items sold at public places. However, per consumers, atleast the water bottle manufacturers seem to be finding ways to circumvent the dual MRP ruling. 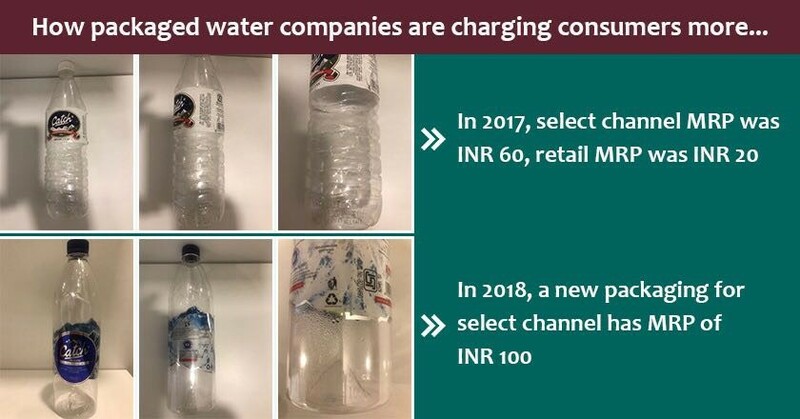 Many consumers have reported in the MRP Enforcement community on LocalCircles that water bottle manufacturers are introducing water bottles in new packaging and selling them at an MRP even higher than the previous select channel MRP and selling them in restaurants as well public places like multiplexes, airports etc. In another gross violation of the Legal Metrology rules, some reports in form of actual pictures taken by consumers also show packaged water bottles not having an MRP at all. In an example shared by consumers, a bottle which earlier had a select channel MRP of INR 60 is now packaged differently and has an MRP of INR 100. The retail MRP of the original bottle was INR 20. 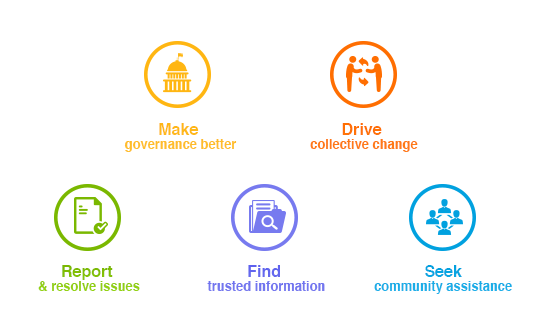 LocalCircles also conducted a poll to collect some actual data on the issue. 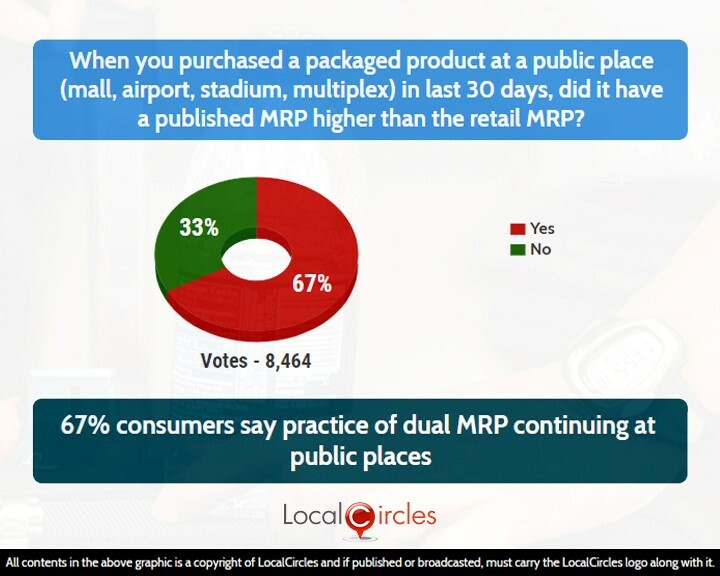 The poll asked consumers when they purchased a packaged product at a public place (mall, airport, stadium, multiplex etc.) in the last 30 days, did it have a published MRP higher than the retail MRP. 67% of the 8,464 respondents answered in a ‘yes’ while 33% answered in a ‘no’. In an earlier poll, consumers were asked if placing vending machines in public spaces could be a solution to ensure MRP compliance. 88% consumers had supported the move while only 6% had voted against it. 6% were unsure about it. Many consumers are now of the opinion that Government should make placement of vending machines with retail MRP product version mandatory at public places like cinemas, malls, stadiums etc. so atleast commodities like packaged water are available at affordable prices.